Gorgeous right?! There isn't one thing I'd change in her design. The pathway to the fire pit is as spectacular as the fire pit itself. Can you just imagine the possibilities this area provides in terms of outdoor entertaining? 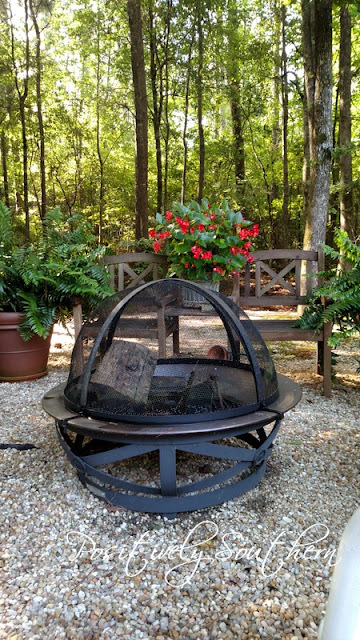 The area around the fire pit is very shaded which lends to it's beauty. Almost as if you are taking a walk into the woods. The ferns are massive and seem to be thriving in this space. This path leads to what appears to be a potting area as well as a place to store wood for the fire. Be sure and notice how she has camouflauged the black chain link fence with Jasmine. As you all know, I adore an evolved space. The patina of the seating adds to the charm, I love that it isn't freshly painted, stained or matchy matchy. The pops of red from the begonias really brighten and punctuate the space. The stonework looks like it has always been there doesn't it? It sets the expectations of what is to come as you enter the space. I'd like to leave you with the view I saw as I turned to leave. It truly is beautiful! This is truly a stunning space! I could sit there for hours reading or enjoying company for sure!!! What a lovely retreat, Tamyra! This is the kind of space that makes you just long to spend time outside. How relaxing and serene! Absolutely beautiful. A Truly happy place.